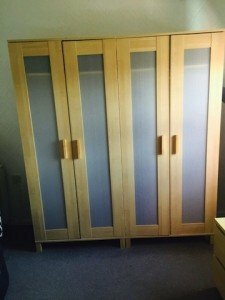 A pair of tall standing light wood Ikea double wardrobes, inlaid with frosted plastic panels. 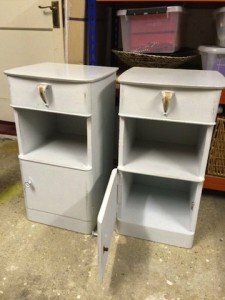 A pair of hand painted white bedside cabinets in the shabby chic style, having one shelf above a small cupboard. 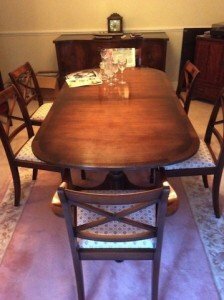 A vintage mahogany rounded edged dining table, together with six matching dining chairs upholstered in patterned fabric. 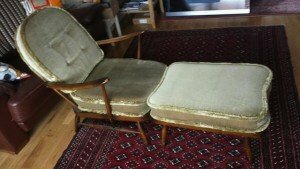 A vintage high back gentleman’s armchair on brass feet, upholstered in mustard and grey floral patterned fabric. 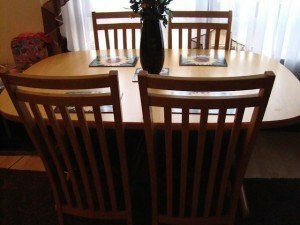 A large modern solid wood rectangular dining table, inlaid to the top with three glass panels, together with sic white faux leather dining chairs. 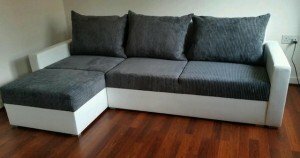 A four seater low back contemporary corner sofa, upholstered to the base in white faux leather and grey cord fabric to the cushions. 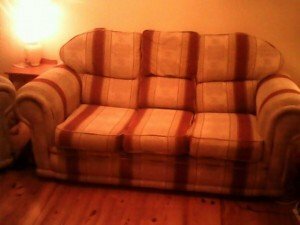 A vintage high back three seater sofa on brass legs, upholstered in orange and cream striped fabric. 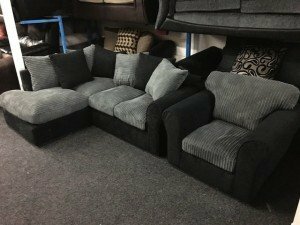 A small four seater low back corner sofa and matching armchair, upholstered in grey and black velour. 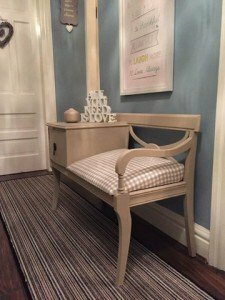 A hand painted cream solid wood telephone table in the shabby chic style, upholstered to the seat in gingham fabric. 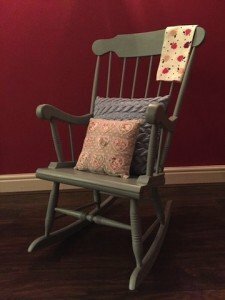 A vintage solid wood shabby chic rocking chair, hand painted in green, together with two small cushions. 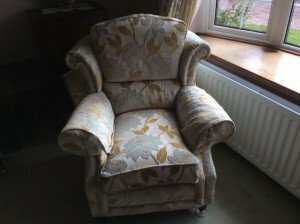 A vintage high back armchair on a solid wood base, together with a large matching footstool, upholstered in green velour. 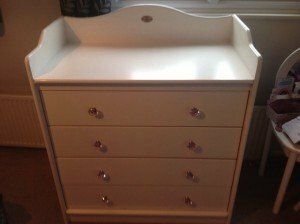 A chest of five drawers in the shabby chic style, hand painted in white with pink crystal knobs. 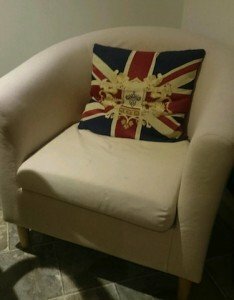 A large rounded back contemporary tub chair on wooden legs, upholstered in cream faux leather. 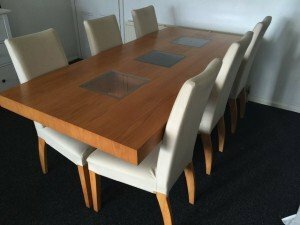 A solid wood rounded edge extendable dining table, together with four matching high back dining chairs. 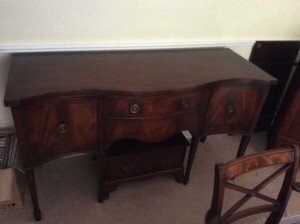 A vintage mahogany console desk, having two large drawers aside a small central drawer. 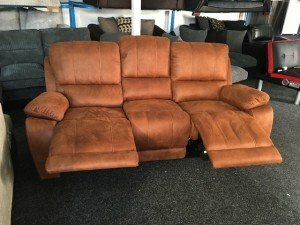 A three seater high back reclining sofa on metal feet, upholstered in tan brown suede. 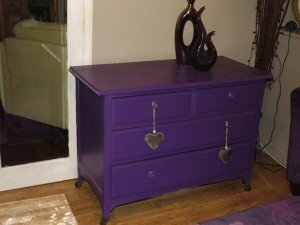 A solid wood chest of drawers hand painted in purple, having two small drawers above two large drawers. 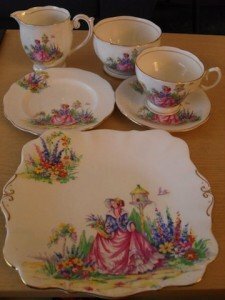 A bell vintage fine bone China garden scene tea service, include a platter plate, a teacup, two saucers, a sugar bowl and a milk jug. 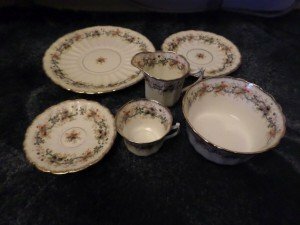 A Royal Albert daisy pattern fine bone China kitchen set, includes a milk jug, a teacup, two saucers, a dinner plates and a serving bowl. 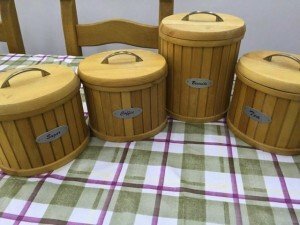 A set of four solid wood cylindrical kitchen canisters, includes a biscuit barrel and tea, coffee and sugar canisters.